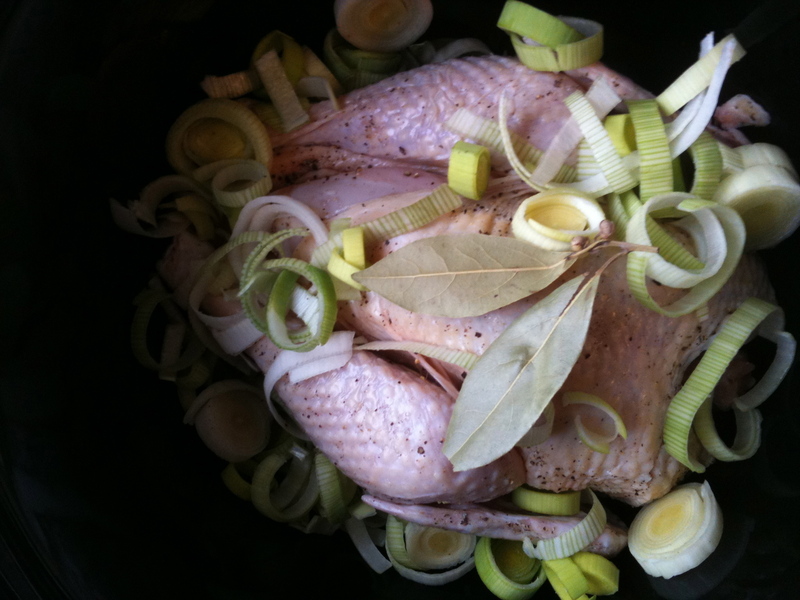 Slowcooker Chicken Soup, at the beginning. 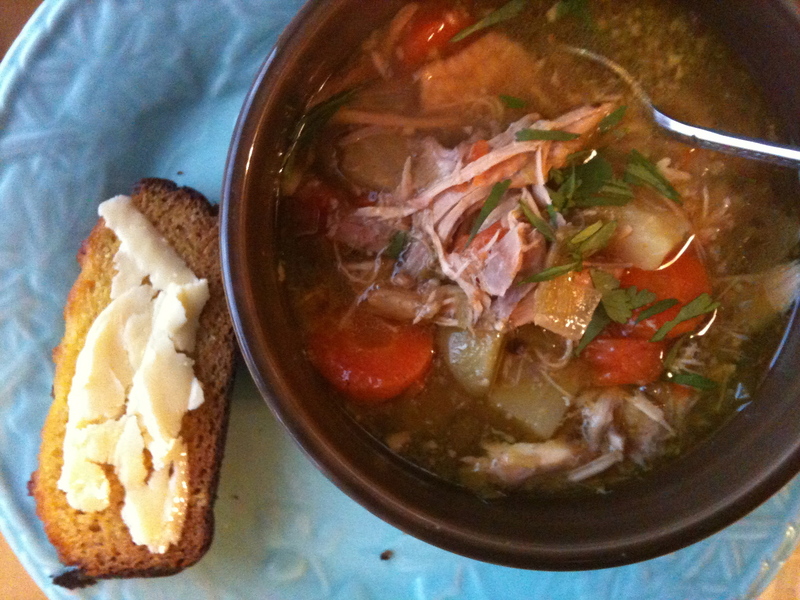 One of my favorite foods growing up was the Saturday-After-Thanksgiving turkey soup my mom used to make. After Thanksgiving dinner she would stand in the kitchen for what seemed like hours, meticulously cleaning off the turkey carcass, gleaning those nice chunks of meat from between the bones for our Friday-After-Thanksgiving lunch: turkey, stuffing, and cranberry sauce sandwiches. (Those were mighty good sandwiches, especially if I could delay eating them until the leftover gravy was warm enough for dipping.) Once the carcass was clean enough, she’d cover it with water in a stockpot, add in some magical ingredients that I don’t remember, and set it to simmer on the back of the stove. I’d eye that pot all day Friday, and I think maybe my sometimes-impatient father would sneak a bit before it was truly “ready” – who could blame him? By Saturday lunch we’d fill our bowls and dig in. I knew it tasted delicious, but honestly had no idea what a special food that was, and it would be many years before I would simmer bones in water with a few vegetables and spices, to make what I now call culinary liquid gold. What makes bone broth so special? Let me take a few notes from Nourishing Traditions to illustrate the many benefits. “Properly prepared, meat stocks are extremely nutritious, containing the minerals of bone, cartilage, marrow and vegetables as electrolytes, a form that is easy to assimilate. Acidic wine or vinegar [or lemon juice] added during cooking helps to draw minerals, particularly calcium, magnesium and potassium, into the broth…. “Gelatin [melted from cartilage and ligaments into the liquid] acts first and foremost as an aid to digestion and has been used successfully in the treatment of many intestinal disorders, including hyperacidity, colitis and Crohn’s disease…. Gelatin also seems to be of use in the treatment of many chronic disorders, including anemia and other diseases of the blood, diabetes, muscular dystrophy and even cancer…. “Other important ingredients that go into broth are the components of cartilage, which recently have been used with remarkable results in the treatment of cancer and bone disorders, and of collagen, used to treat rheumatoid arthritis and other ailments…. In times of plenty we often forget to practice and teach the ways of frugality. The prosperous 20th century saw us relying increasingly on quick methods of food “production” and “manufacturing”, as the old ways of food preparation and stewardship nearly died in the process. Meat stock has been largely replaced by boxed broth and boullion cubes, both providing a small fraction of nutritional value or richness of taste (and usually delivering a strong dose of neurotoxic MSG in the process). In my younger days I paid extra for boneless, skinless chicken pieces – not realizing the nutritional wealth I was paying to have removed! No more, friends. Buy the whole chicken. Even if you buy the more expensive organic and/or pastured chicken, I’ll show you how to make it worth its price. Watch for tomorrow’s post, where I’ll show you how to get 3 meals out of 1 whole chicken. For now, visit Nourished Kitchen and check out this delicious recipe for Slowcooker Chicken Soup. I made it over the weekend and it truly does nourish any soul, especially a weary one. Slowcooker Chicken Soup, at the end. Served with a side of Coconut Flour Bread with fresh butter from this weekend’s trip to the Organic Pastures booth at the farmer’s market. Sweet heaven! Glad to know all those hours in the kitchen provided some good memories and maybe a foundation for “frugal” cooking. Yum! Yesterday, my husband made a broth, but didn’t do it in a slow cooker. He ended up using it for chicken & stars soup for the kids, and a delicious Thai chicken soup for us. So comforting! Tonight I’m making roasted pork loin and root veggies. The recipes for chicken – soup, tacos, roasted – sound delicious. I’m inspired to start cooking! Thanks for the ideas. Thanks for visiting, Tanya! Let me know how it goes! The leftover turkey carcas is the best part of the Thanksgiving meal! I toss in most of the leftover veggies in too. On the rare occasion that I eat elsewhere for Thanksgiving, I often pick up a small turkey later and still make my soup and put some in the freezer in my mountain home for emergencies.